The first writings about Targoviste as capital of Wallachia were found in the journal of Johann Schiltberger, who fought in the Nikopol crusade in 1396. The core of the princely Court was built during the time of ruler Mircea the Elder and it was made from a construction complex designated for the royal family, ministries and their servants. From this era dates the defence ditch, the first inner wall, the church from the northern side of the court (the foundations can be seen close to the Chindia Tower built by Vlad the Impaler) and the old rulers house(but now we can only see the walls of the ground floor and of the cellars). In the residential area there are more construction stages, the oldest one being built during the time of Mircea the Elder (1386-1418) It was made from a ruler`s house, southern church and inner wall. The first ruler houses were built in a square plan having 29x32m. sides, cellars, ground floor and walls 2 meters thick. The cellars were under the entire building, and they were made from 4 naves separated by vaults on massive pillars of masonry.That was something extraordinary at that time, being the first cellars with vaults in the Romanian architecture. The entrance is on the west side and light enters through twelve high windows. On the interior of the cellars was also the dungeon. On the high ground floor they built architectural elements like vaults, small niches which help us understand how they built the rooms inside. The rooms for the ruler and his family we suppose were on the east side where we can also see a big room 6x12 m. which probably was the council room. 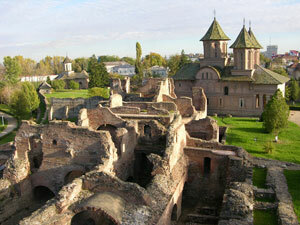 During Vlad the Impaler’s time (1456-1462, in 1476) other constructions were made. The most important one is TurnulChindiei. At the end of the XVIth century, PetruCercel built a big church, an aqueduct and near the Ialomita river, the Prince`s Gardens. During the Turkish occupation from 1595, as well as the campaign of Michael the Brave, the royal court was burnt many times and damaged. Afterwards, during the time of MateiBasarab (1632-1654) the court had a flourishing period. The ruler`s houses were repaired, the wall was doubled and for the court`s needs a Turkish bath was built. The Phanariot regime era was a bad time for the court. It was demolished at the request of the ruler of Wallachia, Gheorghe Ghica, because the sultan considered it as an anti-ottoman resistance point.